“I’ve got a groomer,” Michelle calls out. I look over the top of my binoculars to see which direction she’s pointing, and try to focus in the same way. Nothing but kelp, a few cormorants, and the dizzying rolling of the waves. I turn my binoculars back in the direction I had them, but my own otter–a feeder–must have dived back down for another course. The wind blows, adding an icy chill to the gray sky day. I had the opportunity to go out otter counting yesterday–Michelle Staedler from the Monterey Bay Aquarium’s SORAC program and Jack Ames from Fish and Game were kind enough to let me join them on a leg of their spring otter count. The count is coordinated by USGS’ Western Ecological Research Center. Compared to many people, I’m pretty good at picking out otters, but I had nothing on Michelle and Jack–combined they’ve probably got more than half a century of otter spotting behind them. We combed the coast from Malpaso Creek and down–and I mean really combed. Because the otter count is done in a census style (they count all the otters they can) instead of a sample, it’s important that they check the whole coast at different angles to be sure they didn’t miss any. This had us walking along the highway, climbing through fields of coastal scrub and peering down into coves. The wildflowers are spectacular this year, and even in the foggy gray–which Jack tells me is better lighting for otter counting anyway–it was a nice way to spend a day. 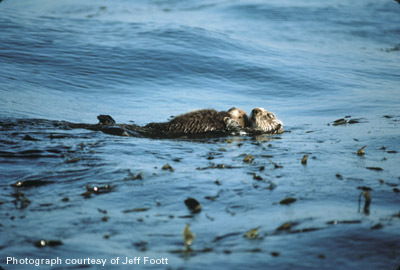 This survey is part of a concerted effort throughout the sea otter range to conduct the spring sea otter count. The count will help tell us how the sea otters are doing, and is one of the most important of several indicators that we use to assess the status of the population. Last year the spring count was down enough to reverse the trend of population growth into a decline, so we’re all a little anxious to see what this year’s count will bring. We didn’t see many otters–both Jack and Michelle seemed a bit surprised at how little kelp there was. By this time of the year, it was usually thicker and full of otters, they said. One sheltered cove towards the end of our count was conspicuously empty, even though it seemed like prime otter territory. We did see some good, typical otter behavior. The highlight was an otter mom and a pretty small pup. We found a spot right above her cove, which was sheltered by a big rock, and fixed our binoculars on her. She seemed to be watching us right back, which prompted me to wonder aloud how good their vision really was…she kept her face turned towards us even as we turned away to scan the waters south for her nextdoor neighbor. When the pup let out its high pitched squeal, I was not the only one to break into an awwwww. It’s easier to see otters when you have a little height. 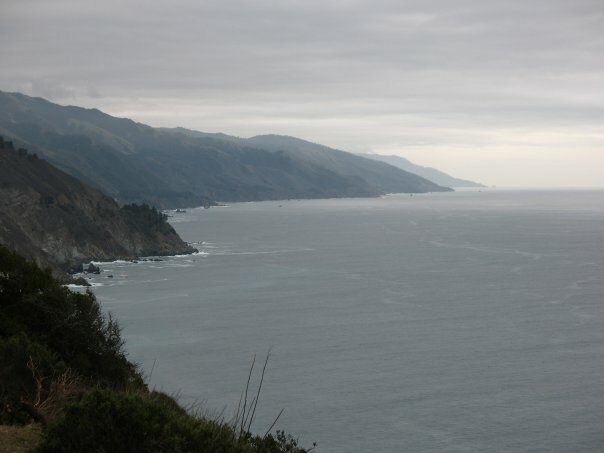 Try looking from a bluff, instead of a flat beach. Otters can be found in the open water, but tend to stick close to kelp forests or rocky areas that would offer up good eats. It can be hard to distinguish otters from the large macrocysts of kelp, or other marine mammals like harbor seals. You can usually tell it’s an otter by the conjoined head and feet–look for two bobbing spots instead of one. Follow the trail of gulls. A seagull will often float hopefully next to a feasting otter, hoping to steal some grub. If you see a gull floating next to a lump, it’s probably an otter. Want to try your luck, but are too far to make it to the Central Coast? USGS has a website that asks ‘what does it take to be an otter spotter?’. See if you can count the otters from the kelp. We’ll be leading an otter walk on May 22nd for Endangered Species Day, so if you’re in the Monterey area, be sure to join us and test your otter spotting skills. We also expect to see harbor seal pups, and other marine life. Let us know you’re coming on facebook. This entry was posted in General Information, Otter Spottings, Partners and friends, Sea Otter Status and tagged monterey, Otter Spottings, sea otter, sea otter census, sea otter count, sea otters, The Otter Project. Bookmark the permalink.